Since George Washington delivered the first inaugural speech in 1789, every elected president has addressed the nation after taking the oath of office. These inspiring, uplifting, and informative inaugural addresses capture the spirit of the times and the mood of the country every four years. Some rank among the landmark speeches in American history, particularly the inaugural addresses of presidents Thomas Jefferson in 1801, Abraham Lincoln in 1865, Franklin D. Roosevelt in 1933, and John F. Kennedy in 1961. Capturing pivotal moments in our nation's history, My Fellow Citizens features the original text of all 56 inaugural speeches, each with an explanatory essay. 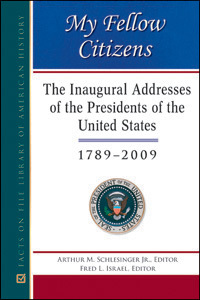 Updated to include expert commentary on the 2008 election and Barack Obama's 2009 inaugural address, this resource highlights key themes and provides valuable historical context essential to understanding each inaugural address. Destined to become a classic reference, this accessible book is an indispensable volume no library or history buff should be without. "...will be of use in high school and undergraduate libraries that would like the convenience of having all of this information in one handy package."